Robby Fabbri broke out of a scoring funk and added to his hat collection in the process. 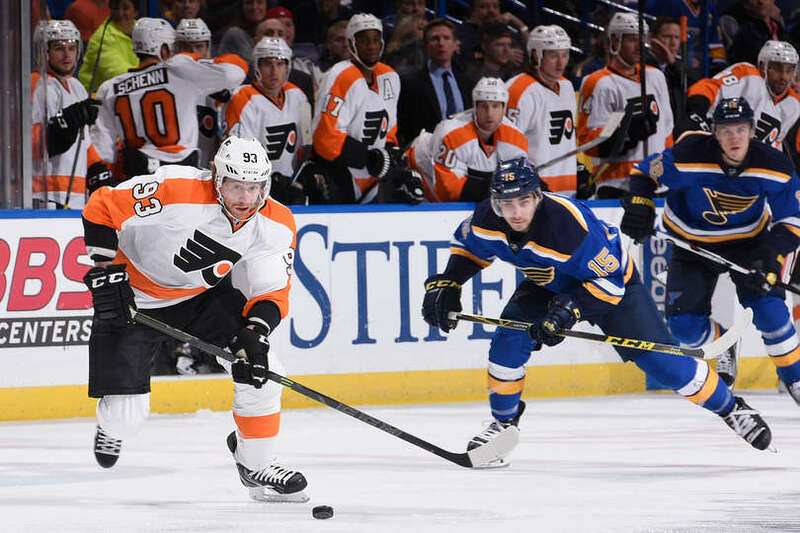 Fabbri got a hat trick, David Perron and Scottie Upshall scored during St. Louis’ four-goal third period and the Blues rallied to beat the Philadelphia Flyers 6-3 on Wednesday night. Kevin Shattenkirk also scored and Carter Hutton made 17 saves as the Blues improved to 12-1-4 at home. Wayne Simmonds, Nick Cousins and Brayden Schenn scored for the Flyers, who dropped their fourth game in their last five since ending a 10-game winning streak. Steve Mason made 19 saves. Perron deflected Colton Parayko’s shot to tie it 5:53 into the third, less than two minutes after Schenn gave the Flyers a 3-2 lead. Perron ran his goal-scoring streak to three games. Upshall put the Blues ahead 80 seconds later with a deflection of Joel Edmundson’s shot. It was his first goal in 18 games. Fabbri’s second of the game with 4:59 left gave the Blues insurance, and he added an empty-netter for the hat trick two minutes later. ”Everyone was sticking to the game plan and knowing what was making us successful,” Fabbri said. Parayko, who had two assists, said there was no panic after falling behind in the third. Simmonds scored his team-leading 17th goal just 3:25 into the game, tipping in a backdoor pass from Travis Konecny into a wide open net. Shattenkirk tied it with a power-play goal with 4:59 left in the first. Six of Shattenkirk’s eight goals this season have come with the man advantage. Fabbri made it 2-1 with another power-play goal with 11 seconds left in the opening period. It was the first career hat trick for Fabbri, who snapped a seven-game scoring drought. The Blues had multiple power-play goals in a game for the first time since they went 3 for 7 against Tampa Bay on Dec. 1. Cousins tied it for the Flyers at 4:32 of the second period, tipping in Ivan Provorov’s shot from the point. Cousins’ deflection went off Blues defenseman Carl Gunnarsson’s leg and into the net. Schenn gave the Flyers a 3-2 lead at the 4:13 mark of the third period with a power-play goal, his seventh goal this month. NOTES: Shattenkirk played in his 400th game as a Blue and become the 12th defenseman to reach that plateau with the team. … Flyers C Sean Couturier returned after missing 16 games with a lower-body injury. … The Flyers and Blues were the only teams in the NHL to have had a full five days in between games over the Christmas break. Flyers: Travel to San Jose on Friday night. Blues: Host Nashville on Friday night.